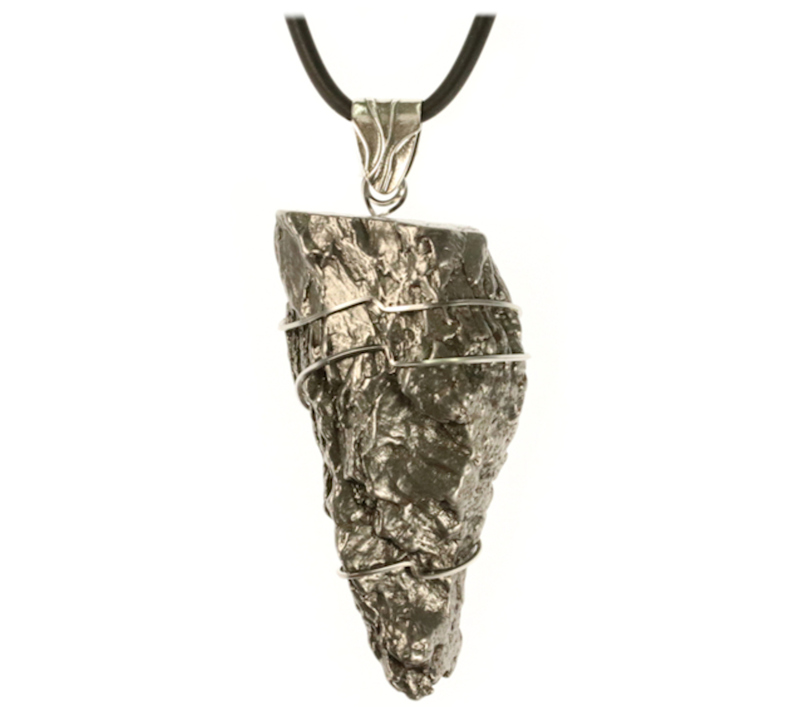 This Campo del Cielo iron meteorite jewelry is wire wrapped in stainless steel and is shaped like an arrowhead or football, flattened on one end. The stainless steel wire is great for meteorite jewelry for men and gives it a natural, conservative, and modern look. The gunmetal facings of both the front and the back of this meteorite reflects light well off its many surfaces, and the overall effect is one of both mystery and beauty. This meteorite jewelry is quality through and through! Meteorites are among the greatest sojourners in our solar system that we can actually hold in our hands. Traveling untold distances, they circle the sun with us until gravity and timing eventually allows them to make their way to our planet's surface. They come to our planet as fiery bolides raging against the sky as they plummet to earth. The Campo del Cielo meteorites are found in a distribution of 26 different craters scattered across the northern parts of Argentina. They are thought to have fallen to earth around 2,200�2,700 BC. The native inhabitants first named the meteorites Piguem Nonralta. The Spanish explorers that arrived to the region in the 1570s later translated what the natives called the meteorite into its now more familiar name, "Campo del Cielo" or "Field of the Sky." This distinctive meteorite pendant necklace is professionally shipped in an attractive quality jewelry box with information and a Certificate of Authenticity. Meteorites make great gift for these occasions: birthdays, graduation, special vacation, weddings, anniversaries, Valentine's Day, Mother's Day, Father's Day, end of summer, back to school, special friends, and Christmas. They also make great awards gifts. Pendant size: 3 1/2" L X 1 1/4" W X 5/8" D, Weight: 93 grams; The black cord chain is 24" long with a lobster claw clasp. This is a big meteorite so it is perfect for a large framed person!